Many RV campers automatically presume that staying in public areas prevents crime. However, this concept is far from the truth. Victims of camping crimes are often shocked that the unthinkable happened. The U.S. National Park Service reports that between 2002 and 2007, the list of crimes included 37 kidnappings, 63 homicides, 240 rapes, 309 robberies and 1,277 personal attacks. Many park rangers now wear handguns and soft body armor. While comfortably slumbering on your comfy RV mattress during the night, you might be especially vulnerable to crime. When deciding on a spot to park for the night, avoid remote, rarely traveled areas. Park in a location close to other campers. The ideal spot is well-lit at night. Try to choose a spot that illuminates the vehicle entrance. Back into sites, this way, if danger should occur, making an immediate escape merely entails driving forward from the scene. Never leave anything of value outside of the camper, which may attract the attention of an opportunist. Keep bikes, hitches or tow bars inside. As RV keys are often interchangeable, avoid storing valuable items in compartments having outside access. Inside the RV, put valuable personal items in a permanent safe or make use of stash safes. These devices resemble everyday objects that may include aerosol spray cans. However, the device conceals a storage compartment. Before bedding down on a cozy camper mattress for the night, lock the doors and windows. Do not leave windows open if they allow quick access to a lock by simply cutting through a screen and reaching inside. 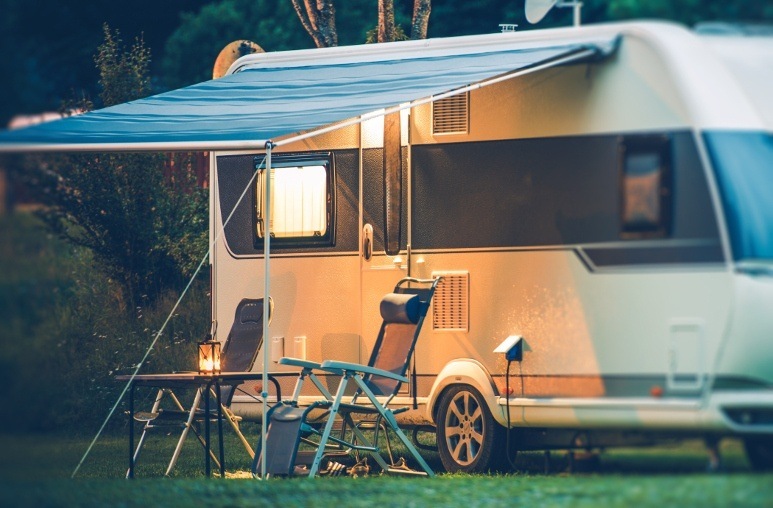 Alarm systems might include something as basic as one or more battery operated motion detectors strategically placed within close proximity to the RV entrance. More elaborate wireless systems safeguard RV interiors, doors, windows, compartments and a pre-determined exterior perimeter. Invest in a canister of pepper spray and keep it close while sleeping. Wasp spray or a spray bottle with chlorine bleach are also effective. Make sure that the smartphone gets fully charged before nightfall and always stays within reach. Perhaps invest in a simple whistle and keep it at bedside. The shrill sound will assuredly attract the attention of other campers if danger comes near. The noise also scares off would be attackers. Especially if traveling alone, create the impression that more than one person is camping. Leave out more than one lawn chair or a couple of pairs of shoes. Women traveling alone benefit from displaying a large pair of men’s shoes. Purchase a large dog dish and place it in plain site to give the illusion of a four-legged guardian. Know your neighboring campers before bedtime. Stay observant. If someone knocks on the door in the middle of the night for assistance, resist the urge to immediately open the door. Do you know other safety tips you would like to share with fellow campers? This entry was posted in RV Lifestyle and tagged RV living, Safety. The Ideal Number of Hours for Sleep Is….